In 2013, Hanukkah takes place from November 27 until December 5The Jewish religious celebration lasts for eight days and nights, and is a commemoration of the re-dedication of the Holy Temple in Jerusalem, in Here is a good rundown of what Hanukkah entails, including more about its history and traditional activities. Because the occasion is based on the Hebrew calendar, the dates on the Gregorian calendar can fall anywhere from late-November, up until the end of December. Bloomex has assembled a page consisting of some lovely Hanukkah flowers to celebrate the season with. One bouquet that's been popular in past years is the Hanukkah Special bouquet. 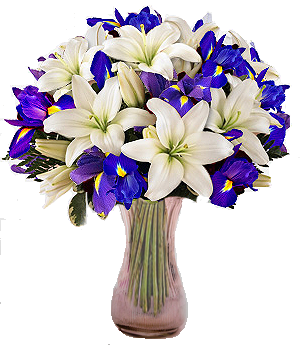 This artful arrangement consists of 12 White Lilies, 12 Iris' and an assortment of greens. The Blue and White Joy is another popular bouquet throughout any time of year, featuring 12 gorgeous White Calla Lily blooms coupled with 3 stems of Delphinium. Be sure to check out Bloomex's Hanukkah Flowers page for a full variety of arrangements to choose from. Happy Hanukkah to all. In 2013, Hanukkah takes place from November 27 until December 5. The Jewish religious celebration lasts for eight days and nights, and is a commemoration of the re-dedication of the Holy Temple in Jerusalem, in Here is a good rundown of what Hanukkah entails, including more about its history and traditional activities.